Fyfe, Richard W.. "Peregrine Falcon". The Canadian Encyclopedia, 04 March 2015, Historica Canada. 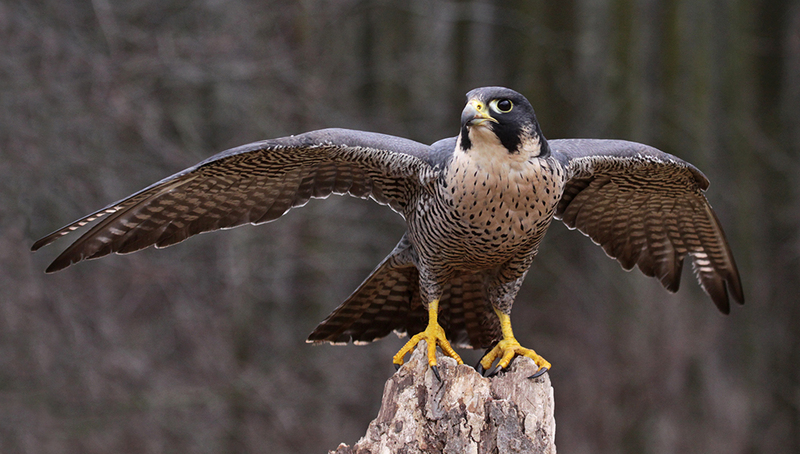 https://www.thecanadianencyclopedia.ca/en/article/peregrine-falcon. Accessed 24 April 2019. The peregrine falcon (Falco peregrinus) is a crow-sized, long-winged bird of prey, generally acknowledged to be the swiftest bird (attaining speeds of over 320 km/h). The endangered peregrine falcon is responding to conservation measures (photo by Pierre Pouliot/Gouvernement du Québec). The peregrine falcon (Falco peregrinus) is a crow-sized, long-winged bird of prey, generally acknowledged to be the swiftest bird (attaining speeds of over 320 km/h). The name, which means "wandering", is well suited to this species, represented by 18 races and found breeding on every continent (except Antarctica). Adults are dark blue-grey to blue-black above with dark bars on a salmon to white breast and belly. They have either very dark cheeks or moustachelike markings on the side of the head. Immature birds have brownish plumage with darker, longitudinal stripes on the breast. 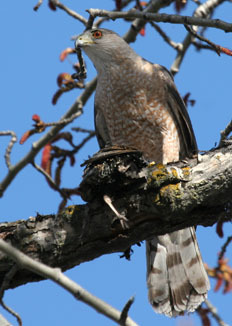 Both sexes have similar plumages, although males frequently have much paler breasts. 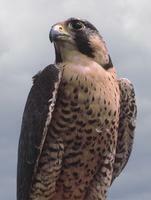 Males (tiercels) are about one-third smaller than females (falcons). Normally, 3-5 eggs are laid on a cliff ledge in a slight depression scraped out of earth or gravel by the female. There is little or no nest. Eggs are incubated, mainly by the female, for about 33 days. The male's role is primarily to protect the territory and provide food for the female and young. When young are half grown, the female may help provide food. Young leave the nest at about 5 weeks but remain nearby and depend on parents for food until they can hunt for themselves. Shortly thereafter, the birds leave the nesting area and begin migration. The first year is very difficult for young. Band-recovery information indicates that only about 1 in 4 lives to return to the breeding grounds. Whether peregrines migrate depends on food supply and climatic conditions. The Canadian tundra peregrine (F. peregrinus tundrius) winters as far south as southern South America, whereas the west coast peregrine (F. p. pealei) is essentially nonmigratory. 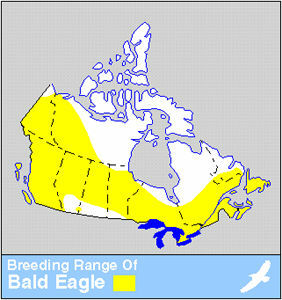 The third race breeding in Canada is the endangered anatum peregrine (F. p. anatum), which bred across Canada wherever adequate food and nesting habitat were available. These birds wintered from the southern US through Central America into northern South America. The peregrine preys almost exclusively on bird species in most parts of its range (coastal and inland cliffs). The anatum peregrine has declined to near extinction in most of its breeding range. The decline is well documented, and studies indicate that the principal cause was reproductive failure resulting from contamination by pesticides (especially DDT), which cause eggshell thinning. The bird has become a symbol of the problems resulting from misuse of the environment. In Canada and the US, specific conservation programs have been very successful, and many young anatum peregrines, bred in captivity, have been successfully released in the wild. See also Wildlife Conservation and Management; Endangered animals. Peregrine FalconSee a description of the natural history and typical habitat of the Peregrine Falcon in Canada. From the "Hinterland Who's Who" website. Also includes video clips, summaries of related conservation issues, and educational resources. U of Calgary: Peregrine FalconCheck out historical data about local Peregrine Falcon populations. From the University of Calgary. Peregrine FalconA great online resource about the Peregrine Falcon. An Alberta Government website.